This card has come to me many times. It is a card of Unconditional Love. There are many people on this earth who have never experienced true unconditional love — the kind of love a pet or animal companion provides to us. 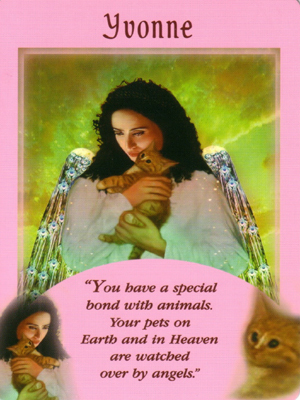 This card is a call from the angels to connect with a special pet or animal companion to receive that precious love of the Creator, and is also a way to help us unlock that “inner child” within — the part of us that desperately, at times, needs that unconditional love of another being. This card may also be a call to work with animals, as they also need US — to be their voice in the world. It could be the angel’s guidance to get involved in animal welfare, either through the adoption/rescue of a companion animal from a local shelter or to become involved in a local or global animal rights organization. There is a love that only a creature so pure as an animal can teach us — one that fosters cooperation and co-creation with another species — they are calling us to be their voices in the world. If we would only help them, they will also help us, become more attuned to LOVE in all of it’s many forms. Thank you for your “free angel card reading” site! I have used it often!! Thank you, Laurie! Thank you so much for taking the time to share your thoughts. This explanation was special to me because I personally have a very special relationship to animals. I do help them, of course, but they help me so much more. Probably due to my childhood, I find it easier to share and trust animal companions in a way that is more difficult for me to do with many of my human friends and family members. Animals are truly furry little angels. Their love is never ending and unconditional. I hope you enjoyed Laurie’s explanation as much as I did. One thing that I would like to note is that Yvonne sometimes shows up for me as a “Hello from Heaven” from pets I have loved and lost. Maybe that will fit you as well. 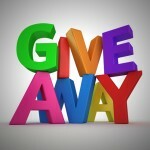 New Free Reading Giveaway Back to School – Cool Backpacks & Free Haircuts!